The Husky 32 oz. Air Compressor Oil is designed to reduce carbon buildup in compressor valves to ensure a longer compressor life. The non-detergent, single viscosity, 30-weight oil provides the proper mix of lubricants for compressors for function properly and efficiently. A must have to ensure you get the best out of your air compressor. The Husky 20 Gal. compressor features a powerful 1.5 HP induction motor and oil-free pump that delivers up to 150 max psi and 4 SCFM at 90 psi. High quality, extended life motor windings equate to 3 times longer life than comparative products. Fully enclosed shroud protects the motor and pump components. Ideal for a host of inflating and nailing tasks, the Husky 8 Gal. Portable Electric Air Compressor is built around a powerful 1.5 HP induction motor for reliable operation and delivers 4 CFM at 90 psi. It features a rugged steel tank and oil-lubricated pump with a durable cast-iron cylinder and it has no belts or brushes to replace for low maintenance. Wheels and a handled frame allow easy transport. Husky 20 gallon compressor features a powerful 1.5 hp induction motor and oil-free pump that delivers up to 150 max psi and 4.0 SCFM at 90 psi. High quality, extended life motor windings equate to 3 times longer life than comparative products. Includes a 1/2 inch impact wrench, 3/8 inch ratchet, 25 ft hose and all fittings necessary to go to work on your medium duty automotive tasks. 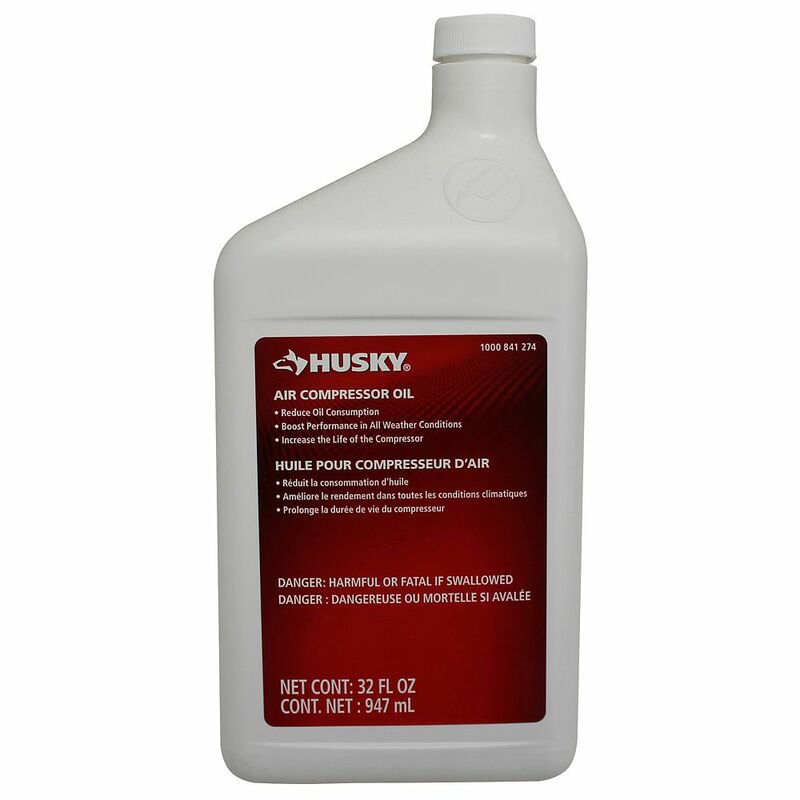 32 Ounce Air Compressor Oil The Husky 32 oz. Air Compressor Oil is designed to reduce carbon buildup in compressor valves to ensure a longer compressor life. The non-detergent, single viscosity, 30-weight oil provides the proper mix of lubricants for compressors for function properly and efficiently. A must have to ensure you get the best out of your air compressor.